Chimpanzee Tea Party: Tobacco was completely unregulated? The Family Smoking Prevention and Tobacco Control Act, as it is called, stops short of empowering the F.D.A. to outlaw smoking or ban nicotine — strictures that even most antismoking advocates acknowledged were not politically feasible and might drive people addicted to nicotine into a criminal black market. But the law would give the F.D.A. power to set standards that could reduce nicotine content and regulate chemicals in cigarette smoke. The law also bans most tobacco flavorings, which are considered a lure to first-time smokers. 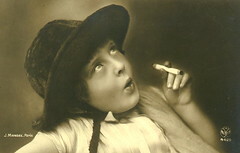 Menthol was deferred to later studies. Health advocates predict that F.D.A. standards could eventually reduce some of the 60 carcinogens and 4,000 toxins in cigarette smoke, or make it taste so bad it deters users. And cigarette makers will be required to stop using terms like “light” and “low tar” by next year and to place large, graphic health warnings on their packages by 2012. I'm against an all-out ban, so I'm pleased nobody is pushing that way anymore, and none of these changes strike me as terribly onerous to the tobacco industry's business model... trying to keep cigarettes out of the hands of children is a clear public good to strive for, even if I'm not entirely certain it will be so effective. After all, I started smoking after I graduated college... not as an impressionable teen(though it was to impress a girl)... and ended up with a ten year pack a day habit. As long as these regulations don't cause an unintended consequence of a surprise increase in smoking rate... because they've somehow made smoking "cooler" or something... it's hard to see how anyone could argue "Oh noes! My rights are being trampled!" because Phillip Morris can't advertise on playgrounds. Of course, that's not going to stop the crazies who want to outlaw the FDA from complaining, but who cares about them? The Association of National Advertisers says the act’s “unprecedentedly broad advertising restrictions” violate First Amendment protections for commercial speech. Legal experts say a court challenge on that ground is virtually certain. Should be interesting to see how that plays out.